Deep, chestnut-red back and outer limbs (dorsal surface). Black face, muzzle, top of head, feet, belly, inner limbs and tail. Highly frugivorous. Also eats flowers and leaves. Typical lifespan in the wild not known. In captivity, life expectancy is c. 21 years for males, 18 for females. Maximum longevity of c. 36 years reached by a female. Parenting is communal. Females stash infants together in a tree to forage, while remaining males and females coordinate vigilant activity to guard infants. Mothers also communally nurse each other’s infants. 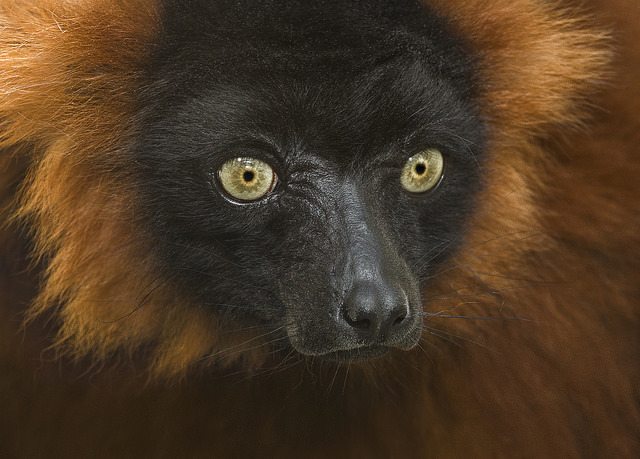 The red-ruffed lemur has undergone a suspected > 80% population reduction over c. 24 years (equal to 3 generations). © 2015 San Diego Zoo Global. Updated October 2015. How to cite: Red-ruffed Lemur (Varecia rubra) Fact Sheet. c2015. San Diego (CA): San Diego Zoo Global; [accessed YYYY Mmm dd]. http://ielc.libguides.com/sdzg/factsheets/ redruffedlemur. We wish to thank Mylisa Whipple for providing expert content review of this fact sheet. Ms. Whipple has been a Primate Keeper at the Saint Louis Zoo for almost 11 years. She is currently the North American Regional Studbook Keeper and International Studbook Keeper for both Red Ruffed Lemurs and Black and White Ruffed Lemurs. She holds a Master's of Science in Zoology with an emphasis in Animal Behavior from Southern Illinois University at Carbondale, in addition to a Bachelor's of Science in Biology with an emphasis in Zoology from Western Illinois University.